Students - We all have things in our lives that trouble us, that we see as worries or dangers. For me, one of these things is the way that technology connects us...but sometimes seems to disconnect us even more. Today's poem explains the way I feel sometimes. Perhaps you have felt this way too. Life is full of ups and downs and beauties and concerns. And we can write about any and all of them. We can comment on the world through our poems. And when we're lucky, the poems we write will meet others at the right time for them. Most of the time, we will never even know when this happens. But we still write. I would love to read some statement poems by young writers, so if you're writing them, please feel free to share them with me through your teacher. Writing can lift the world. Speaking of goodness, over at my other blog, Sharing Our Notebooks, I am happy to welcome third grade teacher Dina Bolan and her third grade writers from Alexander Hamilton Elementary School in Glen Rock, New Jersey. Take a peek at their nonfiction notebook entries, and leave a comment to be entered into a drawing for a new notebook of your own! Thank you to Librarian Jone McCullough for featuring my READ! READ! READ! with illustrator Ryan O'Rourke over at Check It Out today! There's a giveaway for the book, thanks to Boyds Mills Press, so if you leave a comment by next Thursday...you may win a copy. Catherine is hosting today's Poetry Friday roundup by celebrating the wonderful new book CAN I TOUCH YOUR HAIR: POEMS OF RACE, MISTAKES, AND FRIENDSHIP by Irene Latham and Charles Waters over at Reading to the Core. Please visit! Amy, writing is about both the mud and the flowers, the irksome and the delightful. so your poem is perfectly understandable. Poets make statements, note observation on life and often take a political stance. Your observation of modern day phone etiquette (or rather the lack of it) is to be expected. Your poem is so easy to identify with for me. Thanks for sharpening my awareness. Heart wrenching. Did I ever tell you my husband doesn't have a cell phone? A true luddite! I am deeply saddened to see so many people staring at screens when sitting at restaurant dining tables, subway cars, etc... when in the company of others. There's a study floating around out there somewhere that says there are young people who aren't actually on the autism spectrum but appear to be due to their inability to connect with others face to face. There is a direct connection/correlation to screen use. Sad. ouch! sometimes it's the teens and sometimes it's me. Fortunately, we still do know how to talk to each other face to face when it's important. Great short poem for all of us though. Thank you! Your poem commenting on cell phones is spot on. There's such positive potential and yet the downsides are huge. Thanks for tackling this conundrum in your poem and for reminding me that rich poems can be created when we take the time to dwell in the "beauty and concerns", particularly when they overlap. To me this is a sad poem, Amy, that captures a little of the wrong longing and the disconnect that many young people are not just experiencing but suffering. Isn't it a wonder that we didn't realize that perhaps 16 is a good age for a drivers' license AND for social media accounts? This poem to me is a sad one, Amy, in that it captures some of the wrong-longing and DISconnect that many young people are not just experiencing but suffering. Isn't it a shame that we didn't realize that 16 is a good age for driver's licensing and for social media licensing? There are two sides to every coin. I am pretty dependent and close to my cell phone and one of my daughters commented about it. Made me feel pretty guilty. Poems hold truth, even in the 21st century! I am sad that so many walk by as I walk the neighborhood. They look at their phones, do not see the trees and flowers and birds, nor do they see me. This poem reminds me of a mother I saw out walking with her toddler one day. It was a beautiful spring day, but the mom was completely engrossed in her phone, not interacting with her child at all. I'm going to be optimistic and hope that this was not a regular occurrence! Thank you for this reminder to put our phones away. I'm very aware of the lure of the screen and I try hard not to be that person who doesn't look up. 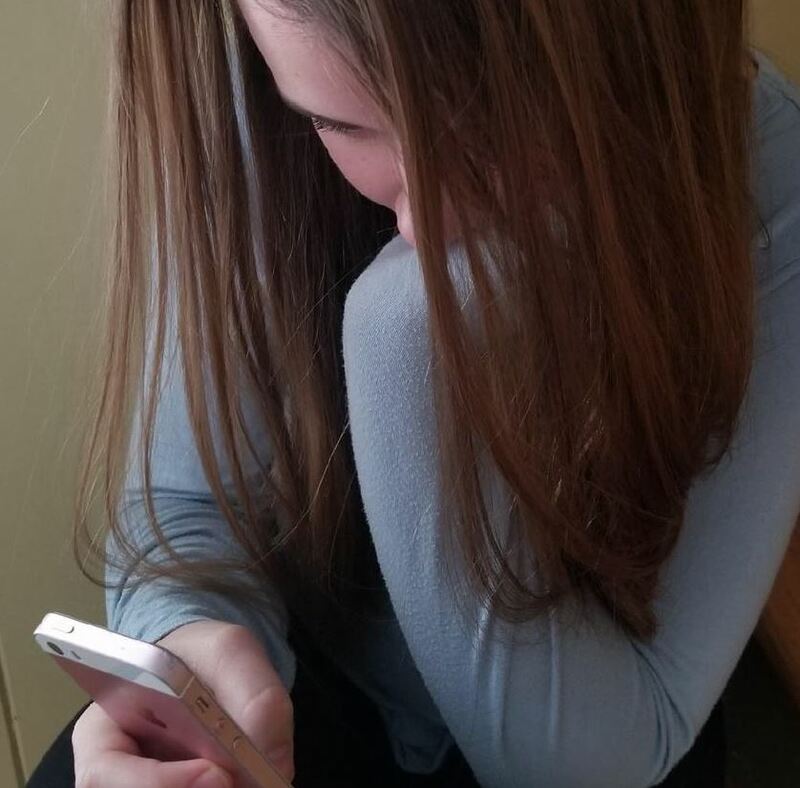 I have often shared your concern as my daughter spends much time on her phone, but this week I am beyond grateful for it as this technology allows us to see and a talk with her while she is in England. I'm still trying to wrap my brain around the fact we can chat over video across an ocean!